One of the most important things to all of us is water; as a noun it is used to quench our thirst or as verb it will provide nourishment for the landscape and livestock. In either case it needs to get from the source to the last stage, most often through pipes. This was the need that was addressed at the last city council meeting in January; the effective and efficient use of water pipes. Over a decade ago the city water system had a significant loss of water. This unaccounted for loss from the water system was the difference in production and the total accumulation of metered usage. The city then hired SAMCO Leak Detection out of Austin to conduct an audit of the water system. As a result a significant leak was found along Main Street near the Cibolo Creek. By using specialized listening equipment a leak below the water line of the creek the leak that was not visible was identified. SAMCO has formed partnerships with water consultants to provide additional services to Texas communities. The partnerships with Texas Drinking Water Solutions and Elston Johnson and Associates allow for additional planning, reporting, regulatory compliance and project financing capabilities beyond the leak detection and field services normally completed by SAMCO. James Beauchamp of Texas Drinking Water Solutions is recently retired from TCEQ where he served as a Special Assistant to the Drinking Water Standards Section. This experience coupled with his time investigating and supporting public water systems contributes to his expertise in regulatory compliance assistance, as well as GIS and distribution mapping. Elston Johnson of Elston Johnson and Associates (EJA) has worked with the Texas Commission on Environmental Quality. He has over 20 years of experience with water system regulatory compliance, permitting, and policy and regulation development. Also with EJA is Barb Johnson. Barb holds a Doctorate in Strategic Leadership and has more than 20 years of experience in leadership development, team effectiveness, organizational culture and strategic foresight. She understands the need to develop a strong people strategy to support the business aims of Financial Sustainability, Quality and Accessibility. If you have interest in learning more about the expanded services that SAMCO is now offering, please contact Sam Godfrey at the TCEQ Public Drinking Water Conference or give him a call. SAMCO’s Sam Godfrey will be in San Antonio Sept. 22-25 attending the Texas Municipal League’s 103rd Annual Conference and Exhibition. Stop by the SAMCO Booth #1645 to learn more about how SAMCO can help your municipality. SAMCO’s experienced technicians will sound on water system access points to identify where water is escaping from the system. The leak report will include findings showing where water flows through meters but is not being registered. provide physical inspections of those larger meters that are subject to measuring errors due to issues resulting from improper sizing, type selection, and installation. This option may be further extended to include accuracy testing of meters inplace where it is practical to do so. SAMCO will generate GPS data on the location of each discovered leak to sub-30 centimeter accuracy. At your option, this service may be extended to include other system features such as meters, valves, fire hydrants or flushing valves, blowoffs, manholes, etc. We’ve been through it all in 2015: drought, floods, flash drought. 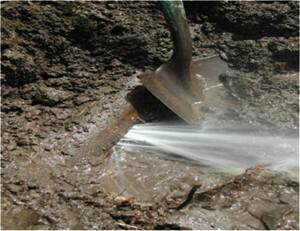 You know that the push-and-pull of moisture in the ground could wreak havoc on your infrastructure. To prepare for whatever is coming next year – Texas is a dry state, after all – it’s critical to be proactive in assessing your system so that you can efficiently use the water supplies you do have. One important piece of that puzzle is making sure your water infrastructure is in good working condition. Regular analysis of your water system can help reduce water losses by locating physical leakage, confirming water meters are in good working order, and avoiding expensive repairs to roads, sidewalks, and buildings caused by leaking water. Not only will these steps save precious water when demand peaks next summer, they also save money, and help water systems meet the requirements for state drought plans and collect data to make vital maintenance, budget, and management decisions. or call Sam Godfrey at (512) 751-5325 for more information. SAMCO’s Sam Godfrey will be in Austin Aug. 11-22 attending TCEQ’s Public Drinking Water Symposium at the DoubleTree Hotel, 6505 I-35 Frontage, in Austin. The event is FREE. Stop by the SAMCO Booth to learn more about how SAMCO can help your utility. Project Manager, this position performs acoustic leak detection, water conservation consulting and GPS data collection services to improve utilities’ infrastructure by enhancing operational efficiency and reliability during water system assessment. For more information or to apply, go to www.samcoleakservice.com. There are two basic common sense steps that a water manager should take to improve the water system’s physical and fiscal integrity. and repaired, the costs to pump, purchase, and treat water for delivery are commensurately reduced. accuracy is critically monitored. Some water managers may naively believe that the newest technology brings about improved accuracy, but that is not always the case. By making sure that customer meters are performing properly over time, the water utility can realize the cash flow needed to properly maintain an efficient system. Of course, when all customers are paying their fair share for the water they use, wasteful use of water is reduced and available water resources are conserved. How much water and dollars can your system afford to lose? water revenue, although seasonal changes and drought are beyond our immediate control, we can use programmed leak detection measures to reduce the cost of excessive pumping. In addition, by proper and critical attention to meter management on both production and consumer sides the utility manager will have the funds required to develop and maintain an efficient, safe and reliable water system. It’s the old, proverbial Win-Win. (a) In this section, “retail public utility” has the meaning assigned by Section 13.002. (b) Except as provided by Subsection (b-1), a retail public utility providing potable water shall perform and file with the [Texas Water Development Board] an annual water audit computing the utility’s system water loss during the preceding year. (b-1) A retail public utility providing potable water that does not receive from the board financial assistance and is providing service to 3,300 or fewer connections shall perform and file with the board every five years a water audit computing the utility’s most recent annual system water loss. (4) retail public utilities serving populations of 10,000 or less. (2) considers differences in population density, source of water supply, the mean income of the service population, and other factors determined by the board. (e) The methodologies required by Subsection (c) shall account for various components of system water loss, including loss from distribution lines, inaccuracies in meters or accounting practices, and theft. regional planning area shall use the information to identify appropriate water management strategies in the development of a regional water plan under Section 16.053.
audit filed by the utility under this section, the water loss meets or exceeds the threshold established by board rule. (2) the use of financial assistance from the board as required by Subsection (g) to mitigate system water loss. For more information, contact the Texas Water Development Board at 512-563- 4841 or click here. Sam Godfrey of SAMCO was a guest on a recent webcast presented by the Texas Water Development Board in Cooperation with the Texas Section of the American Water Works Association. For a excerpt of that presentation, click here. to receive much attention in the media, and rightly so. The state legislature and governmental agencies are developing further conservation measures in an effort to ameliorate the situation. sometimes critical, financial squeeze on our public utility systems. A. The costs of developing, processing and distributing safe, potable water continue to rise due to increases in costs associated with energy; compliance with drinking water regulations; costs of treatment chemicals and other consumables: and ground water withdrawal fees and other regulatory charges. B. Political and public opposition to water user rate increases. demand. The value of that water is forever lost, thereby reducing the available cash flow needed for our utility enterprises to operate at optimum efficiency. day, or approximately 365 million gallons per year, not a sum to sneeze at. individual systems, these loss percentages usually fall within the range of 15% to 30%, with some systems reaching 40% to 50% losses, and more. thorough and conclusive investigation sufficient to determine the nature of the problem, and to quantify its economic cost. meter(s) upon which any further investigations and possible remedies would be based. can be confirmed by qualified inspection and testing in place. In an industry-heavy, municipal system on the Texas coast, an antiquated meter was being used to measure the total intake from its raw water source into its water treatment plant. losses from the distribution system were significantly less than initially thought. that the largest water user on the system was receiving water through a large diameter unmetered connection. There have been cases when production meters or system data was so inaccurate that water loss reports indicated the reporting system sold more water than it produced! A. Distribution system flow measurements and analyses to evaluate the existing potential for underground leakage, system-wide, by zone, or sector. B. Field inspections of existing customer meter connections and interconnections, to determine condition and conformance with appropriate size, type, installation requirements, etc. C Evaluations of Customer Meter Reading, Billing and Data Management procedures. D. Leak surveys to pinpoint locations where water is escaping from the distribution network (the need for which may be determined from the results of the flow measurements in A above). control of our public water supply systems.